Participants at an international conference at the University of Lagos have called for the decentralization of land management in Lagos for effective development. Any form of development takes place on Land, which makes it a very crucial issue. This constituted the major discussions at the just concluded University of Lagos International conference tagged â€˜Land and Developmentâ€™ held at the UNILAG Multipurpose Halls in Lagos, recently. The difference between an exclusive area and a slum is the planning. How sincere is the planning of Lagos, as almost 70% of it being a slum is not acceptable, said Prof Timothy Gbenga Nubi in his welcome address at the conference. Prof. Peter Chigozie Nwilo, the Immediate Past Surveyor General of the Federation, and keynote speaker, explained Geodetic infrastructure, as it provides accurate information about fundamental properties of the earth and how it also constitutes the foundation for any economic activity reliant on spatial data. All states government should be encouraged to produce ortho-photos of their geographic areas at 50cm resolution (10cm preferably) to make it possible for the implementation of systematic land registration of Survey plans, he said. He stated that states should ensure that their local datum are harmonised into the national geodetic network, as well as collaboration with international agencies. A decentralised system of land administration creates more opportunities to the local people in the decision-making process, promotes peoplesâ€™ participation and encourages sustainability, offers more efficient and effective administration and management, said Prof Peter Adeniyi, a keynote speaker at the conference. Adeniyi, Chairman of the Presidential Technical Committee on Land Use and Land reforms stated that there are three broad forms of decentralisation; The first form of decentralisation is de-concentration, which transfers resources and decision-making powers from central (or state headquarters) to local authority while still remaining centralised. He said Devolution is the second form of decentralisation in which the local authority is given more independent powers over the delivery of public services. The third form of decentralisation is delegation. It involves transferring resources and specified powers from government to organisations outside the bureaucratic government structures through a business oriented or privatisation programme but which is still indirectly controlled by central government (World Bank, 1983; White and Smoke, 2005; Sarker, 2003). The Lagos State Land Records Company is a typical example of decentralisation through delegation. Each or any combination of the forms may apply in a particular context, he said. Adeniyi stated that the most desirable decentralisation of land administration in Lagos State is that of devolution of functions such as land registration, land transaction, dispute resolution and other functions as prescribed by the Land Use Act for the Local Government Areas. He said applying this will significantly improve tenure security and land rights, conflict resolution, opportunity for institutionalised credit facilities and job creation. Dealing with land grabbing and growth of informalities will be enhanced. To catalyse Land reforms, there must be Political will and economic foresight as the government must see land reform as an economic imperatives and part of economic reform agenda for wealth creation and poverty reduction and increased government revenue and muster enough political will to pursue it, he said. Streamline bureaucracy in documentation, he said, stating that evidence has shown that even in Lagos State, the bureaucracy for land registration is unnecessarily long. Part of the reform process should be to fastrack the process through decentralisation of operations. Also, special attention should be given to human and institutional capacity building, he said. He stated that non-governmental and civil society organisations, as well as land professionals need to mount advocacy campaigns on the government and enlightenment campaign on the citizens to improve the knowledge about benefits of land reform. The strengthening the local government for effective and efficient land administration, there is imperative need to revisit the making of all land in Lagos urban. The implication of this is that only the Governor is empowered to control and manage the Stateâ€™s land resources. This is against the principle of subsidiarity, inclusiveness and sustainability, he said. 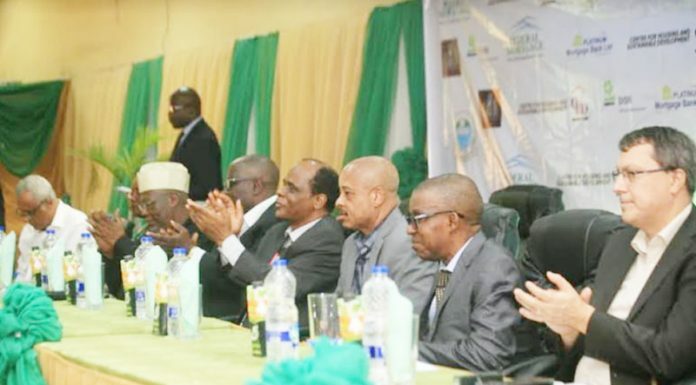 The conference which was sponsored by Dredging International Services in Nigeria and Federal Mortgage Bank of Nigeria (FMBN) drew many scholars, exhibitionists, practitioners, and stakeholders in the land use and development value chain.